“Scientists have been looking to regenerative medicine and tissue engineering approaches to find new solutions for this important problem. The ability to replace a piece of tissue damaged by a heart attack, or perhaps an entire organ, could be very helpful for these patients,” said Lei Yang, Ph.D., assistant professor of developmental biology at the University of Pittsburgh School of Medicine. Thanks to a wealth of funding at the University of Pittsburgh, researchers at the school are able to contribute a great deal of knowledge through research. Lab suppliers interested in staying informed of life science research news at the University of Pittsburgh and marketing lab products in the area may be interested in the latest NIH and NSF funding statistics at the school. The University of Pittsburgh received $430 million from the NIH in 2012. For a full list of life science departments receiving NIH funding organized by department name, total funding awarded and number of awards received, please visit the NIH website. In addition to receiving a great deal of funding from the NIH, the University of Pittsburgh received $24.7 million from the NSF in 2012. For a full list of NSF-funded projects at the University of Pittsburgh, please visit the NSF website. Given the latest life science research news and funding statistics at the University of Pittsburgh, lab suppliers marketing lab products in Pennsylvania may also be interested in exhibiting at life science marketing events at the University of Pittsburgh. 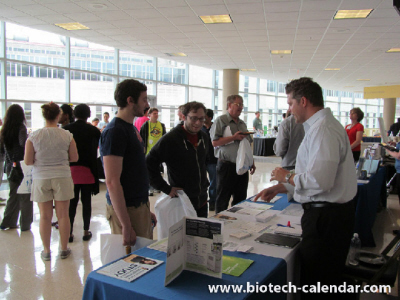 Biotechnology Calendar, Inc. invites all lab suppliers to network with others in their field at our Pittsburgh BioResearch Product Faire™ Event. Last year, the Pittsburgh BioResearch Product Faire™ Event attracted 442 attendees. Ninety-four of the attendees were purchasing agents, professors and post docs, and 66 were lab managers. The visitors came from 26 different research buildings and 55 departments around campus. Biotechnology Calendar, Inc. is a full-service science research marketing and events-planning company that has been organizing trade shows at top research universities for 20 years. If you’d to keep informed about life science research news and market lab products at life science marketing events closer to home, we encourage you to view our 2013 calendar of events. To view more funding statistics for the University of Pittsburgh, or for more information on our Pittsburgh BioResearch Product Faire™ Event, click on the button below.